I wrote a ebook about how christianity is and how it changed the Roman Empire and was one of the most enduring legacies. I hope you enjoy reading as much as I did learning about this topic. Click below to view the whole book! 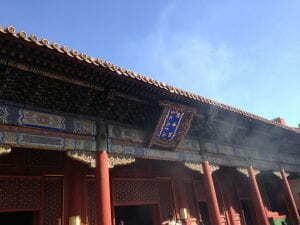 There are so many philosophies in china that are still used today and they have changed how the empire was ruled. 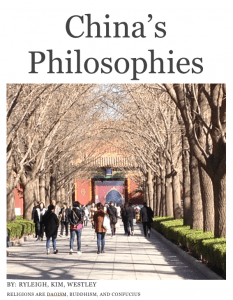 Below is a ebook that has three of the most common used philosophies that has impacted china’s society. When I heard that we were going to different types of temples that we have studied about I was very excited. 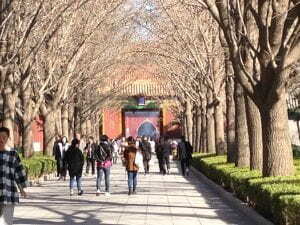 When we got to the first temple which was the Lama Temple as soon as you walked in you saw huge buddhas and lot of people praying and burning essential oils. I was walking around and really thought about why they were burning the oils and learned that they burn the oils because of the smell which helps them focus on praying instead of other thoughts that they might be in their mind. I thought that the burning of the oils was a little unnecessary but, when I found out what they used it for it was quite interesting. Another interesting thing that I learned at all the temples was that you can not step on the blocks in the doorway because it can give you bad luck and is very disrespectful. You also have a specific foot that you step over the things. For girls the left and for boys the right. I learned at the doaist temple that each person is a blank slate and can choose to be good or to be bad and if you choose to be bad there are different realms in the afterworld that you are sent to depending on how bad you were on earth. My Reflection on my One Day Project! Preparing for my one day project was so much fun. We planned a really cool science experiment for the kids and we showed our passions. My passion was health and how we can be healthy. I had four main topics which were how you can be heathy with food, rest, sports, and friendship. These were to remind the kids some heathy choices and not all of them are based on food. I think that I missed out on a really fun and eventful day. How I can be a kinder person! I can be a kinder person by saying nice things to the staff and encouraging my peers. I can also hold the door for others, especially when it is cold in the winter! I need to do better in social studies because I don’t like it so I didn’t put a lot of effort in it. I can improve on it when I have social studies I will pay attention more,this was at my old school. My goal for the first trimester is to improve on the collaboration. I am going to improve on this by trying to not be in satisfactory but be in exemplary by the end of this trimester. I wrote about a very brave girl named Paige. This was a very fun project to work on!